This past August, a few months before my 27th birthday, I was injured in a devastating car accident while on a family road trip. 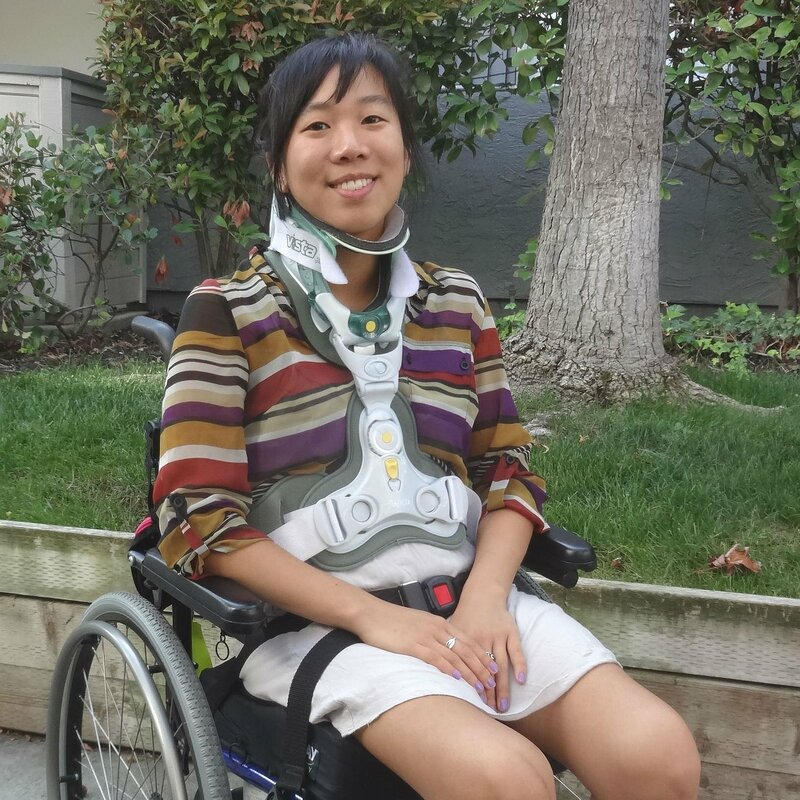 I lost my mother in the accident, and I suffered a spinal cord injury at the T2 level leaving me paralyzed from the chest down. After spending two months in the ICU and going through inpatient rehabilitation, I still have a long road to recovery ahead of me. Before my injury, I was a ballet dancer, a passionate educator, and an all-around adventure seeker. But my injury won’t stop me from doing the things I love. As I acclimate to life in a wheelchair, my family and I are faced with numerous medical expenses. Though I have Medi-Cal (California’s version of Medicaid), there are many costly therapies and equipment not covered by insurance that could potentially help me regain more function below the level where my spinal cord was severed. For example, I am receiving intensive exercise-based spinal cord injury therapy, which utilizes cutting edge technology such as the Functional Electrical Stimulation (FES) bike, which transmits electrical pulses through the legs to prevent muscular atrophy. In addition, my family needs to modify our home to make it accessible for my wheelchair. With your help and generosity, I will be able to get the treatment I need to make the fullest recovery possible, with the hope of walking one day. To help me meet my goal of living an active and independent life, a fundraising campaign in my honor has been established with HelpHOPELive, a trusted nonprofit organization that has been providing community-based fundraising guidance to patients and their families for more than 30 years. All donations are tax-deductible, and may be eligible for corporate matching programs with your employer. Donations are held by HelpHOPELive in the Southwest Spinal Cord Injury Fund, and are administered by HelpHOPELive for injury-related expenses only. Please consider a contribution, no matter the amount. My family and I have been touched by the incredible outpouring of support from our network of family, friends, and the wider community. We want to thank each and every one of you for being in our lives and helping us on the path towards a bright, happy, and healthy future. It’s been 2.5 years since my injury and I am excited to report that I am dancing professionally with AXIS Dance Company and producing a new music project ONIKHO, two of the last things I thought I’d be doing post-accident. Thank you everyone for your continual support. Hi everyone, it’s been about four months since I’ve left the hospital and I have made significant progress in my recovery thanks to all of your generous support. Lately I have been focusing on improving my strength by working out twice a week at SciFit in Pleasanton, CA and taking adaptive swimming lessons once a week. We had met at SCI-FIT in which my son also goes. Stay strong and never give up. You look great. The Ekso is a great part of therapy and has helped so many. Good Luck! Carina, it was so good to see you and to see your positive attitude. Stay strong! All the best with your continued progress! Go Carina! Your positive attitude is inspiring. Good luck with your recovery. Thinking about you in these times. Stay positive Carina! We send you all the encouragement and love in the world, Carina. Sending love, support, hopes and prayers from NYC. I am Daniel C. Boyar’s mom. I met your mom when Daniel and Carlyn were in elementary school. Your mom was a kind and generous person. My condolences to your family. Stay positive for a speedy recovery. Our hearts and prayers are with you Carina! Carina, I am sorry for your loss and for everything you've had to go through. I wish you a full recovery. Big hug. I'm so sorry about your mother, Carina, and about your injuries. Sending you my best wishes for a complete recovery. Carina, I wish all the best to you and your family. I wish you luck and strength in your recovery. Here's to future adventures. My condolences to you, Charlyn, and Serena. I remember your mother was very strong and dedicated to all of you. Keep fighting and I hope you have a speedy and significant recovery. I am so sorry to hear about this. Wishing the best for you and your recovery. Dear Carina, I'm a classmate of Charlyn's and was so sorry to hear about this tragic accident. Wish you all the best in your recovery. Dear Carina: I am a friend of your auntie Betty Taur. I heard your story and will keep you in my prayers. May you continue to heal and May God be with you every step of the way during your recovery. Carina, A passage from "Walden" to guide you on your road to recovery: "I learned this, at least, by my experiment: that if one advances confidently in the direction of his dreams, and endeavors to live the life which he has imagined, he will meet with a success unexpected in common hours." I heard about you via your cousin Jeff, who is an old college buddy. I am keeping you in my thoughts, and hope that you achieve your goals! Keep your spirits up... you have people who you don't even know cheering you on! Heard your story via Kim P. So sorry for your loss. My condolences to your family, and best wishes on a full recovery. Carina, Charlyn I am so sorry for your loss and I hope your recovery is swift. Carina, I haven't seen you in awhile but I remember you from our get-togethers with the Lees. I was saddened to hear about the accident and the loss of your mother. We are inspired by your courage and optimism and wish you all the very best in your recovery! Hi Carina, Although we've never met, Simone has told me so much about you and I feel as if you are somehow a part of our family's lives. I wish you the best of luck in your recovery and look forward to hearing about any progress you'd like to share with us.